As ubiquitous as e-mail is in the workplace today, it took years for it to really change the office. Individuals had been using chat boards and e-mail services long before it became a real work tool outside of the scientific community. Instant messaging bears significant similarities to e-mail. It works in a similar way, except that the IM host tells you who among your contacts are currently online, ready to read a message this instant. It also notifies them when you send a message, rather than letting the message sit in their e-mail server waiting for them to log on to check their mail. And while the use of IM has been popularized by kids talking to friends on America Online, its popularity in the working world is growing. Government offices are finding they need this technology. IM comes in two basic flavors: the expensive, in-house network application and the free, universal Web application. e-mail this week, but available right now.
' Unlike both e-mail and telephone voice mail, it provides instant feedback, so you know your message got through.
' It can help eliminate phone tag and busy signals'even if the other person is already chatting with someone else online, your message goes through. Its drawback is that it can be intrusive, but only if you let it intrude. You don't have to answer to know what someone wants, and if you mark yourself as unavailable, people don't know you're online so they don't interrupt your work. It's worth noting that solving IM's drawback of intrusiveness can neutralize its advantages. But if you don't want to be bothered, you can stick with e-mail. IM is for people who want immediate contact. So, if it is so terrific, why doesn't everyone use it? 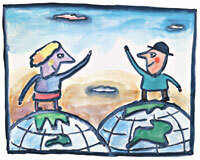 As Internet applications go, IM is brand new, and the Web is what makes it really possible. Until recently, IM on the Web was mostly an AOL feature. On a small LAN, IM doesn't dramatically change the way people work because everyone's desks are physically close. Novell Inc. has had a limited IM system for years without causing any excitement, but it recently introduced a much more powerful IM tool. IM is more useful in an agency where you can't just walk down the hall for a quick chat with co-workers. 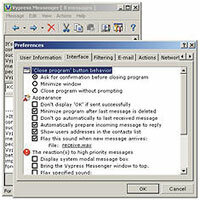 Vypress Messenger has an easy interface for setting preferences. Messenger is priced at $3,000 for 1,000 users. It becomes a really powerful technology when you can exchange instant messages not just with other people in your organization but with anyone with access to the Internet. What's holding back that sort of universal instant messaging from being today's hottest technology? It seems to be mostly a matter of giving a new idea enough time to gain acceptance. Every hot new computer technology is plagued with standardization problems. But fortunately, the big standards battle here is with America Online Inc. Because few government offices or vendors use AOL, this fight generally bypasses agencies. The use of IM in many offices is often held back by management's reluctance or lack of knowledge. If IM has to be paid for, installed and maintained at agency expense it will take time to implement. But this isn't necessary. e-mail and free IM to individuals, companies and government agencies. The Web service performs all the work and if your office has Internet access, all that's required is that you configure individual accounts for each user. There are concerns about privacy and security but, with hackers getting into government networks every day, this isn't a realistic concern for most daily communications. applies to confidential or secret communications, but there is secure IM software available for those users. Free IM services deserve a serious look from government agencies, whether you'll use it as a stopgap measure until you can get in-house IM installed or as a pilot to show management how useful IM can be. A Web-based IM service also could be useful for contacting vendors, even if you already have a full enterprise IM service installed. Given the current lack of standards in IM, it will be easier to communicate with vendors if you share a Web-based service with them. Although AOL isn't used in most offices, it has 23 million members, so its standards battle is important. If an IM standard is developed and adopted, even more developers will build IM tools and its use will expand dramatically. The current problem is that AOL uses a proprietary address system that it declines to open up to competitors. Just imagine how useless e-mail would be if you could only send it to other users of the same Internet service provider. The battle is so important that the Federal Trade Commission, Federal Communications Commission and even the House Commerce Committee are looking into the AOL and Time Warner merger this summer, in part because of the IM standards flap. A year after the first drafts for the Internet Engineering Task Force's Instant Messaging and Presence Protocol were published, AOL last month submitted its own proposal for an open IMPP standard. Even though this is more of an outline than a standard proposal, it is a step forward.